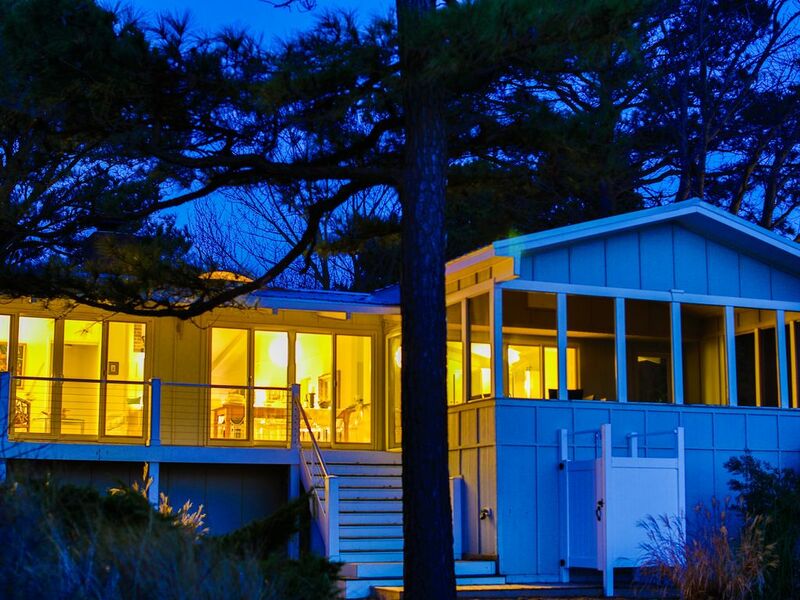 Summerlee - Luxury Chesapeake Bay Waterfront with Sandy Beach! Summerlee awaits you (5 bedrooms, 5 baths total). This classic beach house has been fully renovated and luxuriously appointed. The house features an open floor plan for easy entertaining. Situated directly on Chesapeake, hear the waves while you cook, read or relax; see diverse wildlife including, herons, swans, ospreys, bald eagles, and pelicans through expansive glass doors, from the screened-in porch, the wrap-around deck or the large deck off the master bedroom. Or, grab a beach chair or towel and head for the private sandy beach. The open floor plan, complete with a large kitchen, dining room, 2 sitting rooms and a TV room allows a large family or group to be together whether cooking, playing games, watching television or just relaxing. A crackling fire in the wood burning fireplace makes winter days at Summerlee as enticing as summer days. Enjoy a weekend wine tasting at nearby Woodlawn plantation. A short-bike ride away is Point Lookout State Park, a Civil War site. Today the park, which is located at the intersection of the Chesapeake Bay and the Potomac River, hosts miles of protected land set aside for biking, kayaking, boating, fishing, camping or enjoying nature as well as a museum that provides a historical perspective on the region. Or charter a boat at one of many local marinas for a day of fishing on the Bay. Another nearby historical site is St. Mary's City (10 miles), the original capital of Maryland. Visitors are 25 minutes from dining and shopping on Solomon's Island or in historic Leonardtown. Or enjoy one of several local marina restaurants. Want a day trip away? All that the nation's capital has to offer is a short 80 miles away. Collect shells and beach glass while walking uninterrupted for miles along the sandy beach. Unlike typical cheek-by-jowl beach houses, Summerlee offer its visitors bayfront accommodations on an acre of land. Enjoy rare waterfront privacy so close to major cities and amenities. Love urban life; also, love the isolated beach with amazing wildlife. Scotland is a welcome retreat from hectic city life. Scotland is a rare find. Rarely do you find an area that begins with beautiful forests and opens up onto fabulous beaches. Little traffic but only 2 hours from Washington or Baltimore. I discovered a jewel. Sunrise over the Bay with morning coffee is heavenly. Walks on the beach. Take a 30 minute kayak ride or a 5 hours one - very convenient out the front door. Enjoy a tasting of good quality local wines at beautiful Woodlawn plantation just 10 miles away. If ever I need to come to St Mary's City, I most def will come back to Summerlee! Need nothing but you, your friends and food. This place is well equipped and is ideal for large families or several friends. Have stayed multiple times and will stay again. Peggy couldn’t be a better host. This was my home base for my daughters wedding and we had family and friend coming in and out and the home was well laid out for entertaining. The furnishings and interesting and first class. Amazing retreat on the bay! Our stay at Summerlee was absolutely perfect. The house was spotless, very well layed out with charming and practical furnishings. Directly on the water with a private beach- could not ask for a better view. Tons of space. Property managers were super accommodating. Our favorite place on the bay. Highly recommend. Perfect venue to spend a week with all the grandchildren ages 5-17. Great, clean beach for swimming, kayaking, fishing and crabbing. Newly repainted inside, unit is clean and well stocked with all the necessities for cooking and plenty of space for storage. 4 new bikes and 2 kayaks provided. 2 great decks one open and one screened. Rob, Bob and Katie Bickel, the property managers are great: friendly, courteous and always available to meet your every need, should something be missing. We're already planning our return dates for 2019. Great house with everything in order. Completely outfitted well taken care of. Slack vineyard wine tasting on weekends - 10 miles away at Woodlawn plantation. Also, they host outdoor symphony and other musical concerts in a beauitful waterfront setting. Please contact owner if you would like to discuss a rate arrangement not shown, such as multi-month.